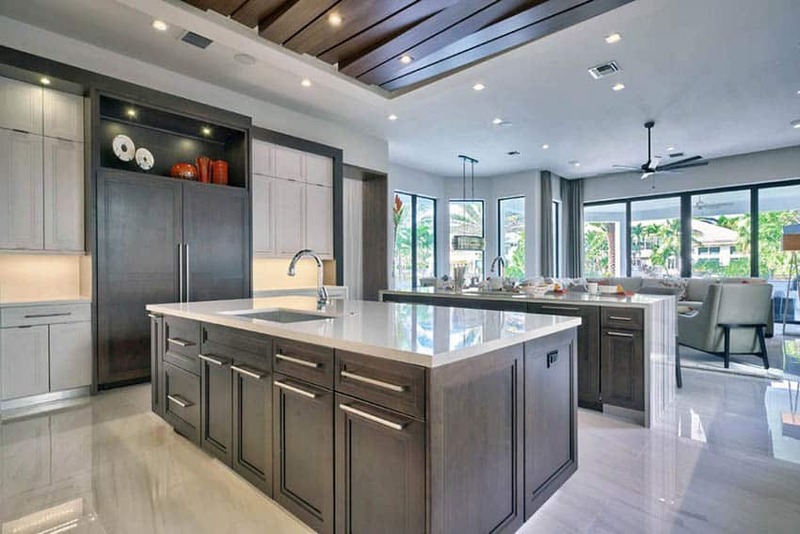 In this gallery you’ll find beautiful open kitchen designs with living room including ideas for paint, finishes and decor. 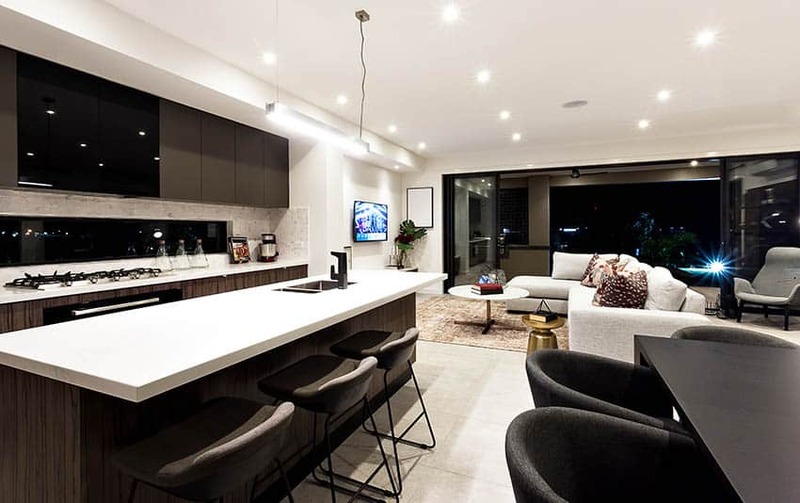 Homes & apartments with open plan design continues to be popular, especially among new developments. Such layout is favored because it helps save space and gives a lighter feel to the space. Open plan layouts are often applied on common areas, such as the living room, dining room & kitchen for residential properties. People usually have different reasons for favoring open layouts. 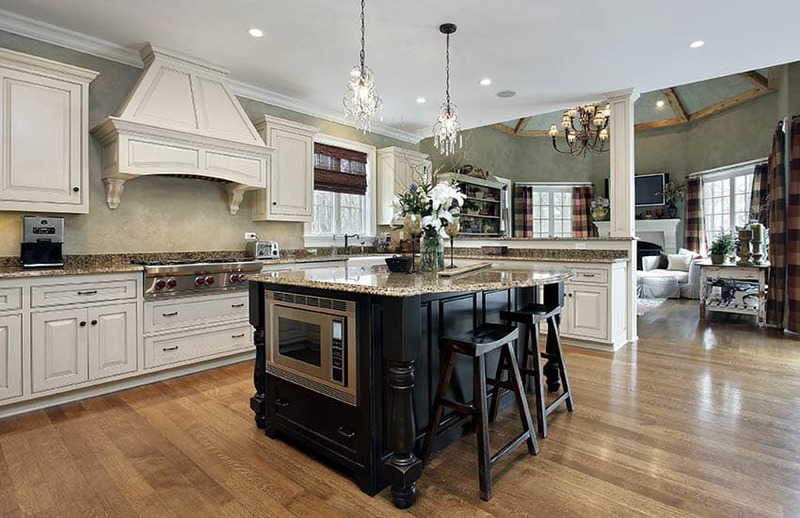 The living room & the kitchen are not often placed adjacent to each other, as the dining area is usually the one placed adjacent to the kitchen. Placing it right by the living area does have it’s advantages though, most especially if you love multitasking & entertaining your guests. An open plan allows you to see what is happening in the living area while preparing food (or perhaps watch tv while cooking) and also allows easy access & communication with the people in the living area, making it perfect for entertaining guests. 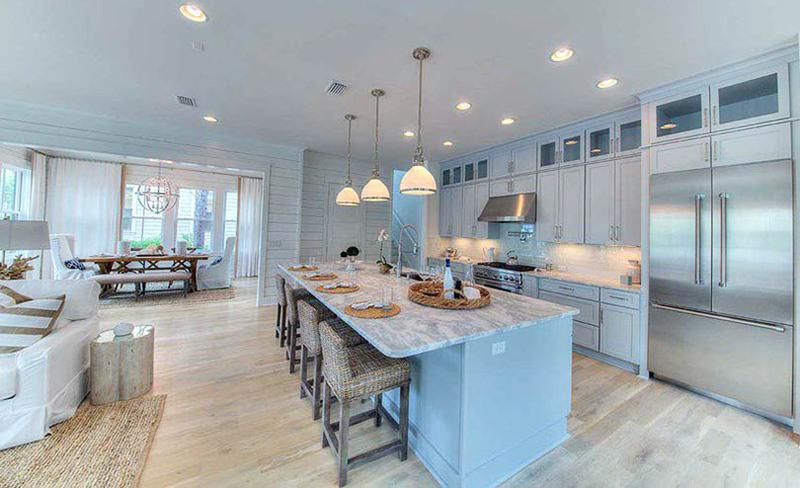 When deciding on a paint color for your open living room & kitchen, keep in mind that it should be able to tie together the two spaces without seeming over repetitive. It should be able to match or complement the colors used both the living room and the kitchen. To get the right balance carefully consider the big picture to create a cohesive design. For a balanced design flow you will want to bring a little of each color from one room to the next. 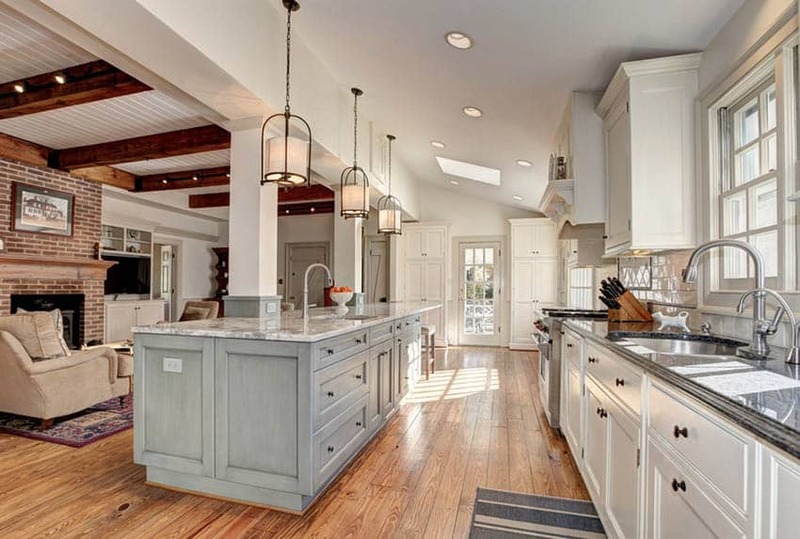 To learn more about the best kitchen paint colors take a look at this page. For suggestions try playing with different shades of white, taupe and warm colors, as they are generally easy to match with any style. You can also use neutrals like gray for more contemporary looks, or light brown shades for a warm and cozy feel. Try using colors of different intensities from the same color palette. The use of a color wheel can help you find complementary color schemes that will have a pleasing effect. For example shades of blues and greens often work well together. 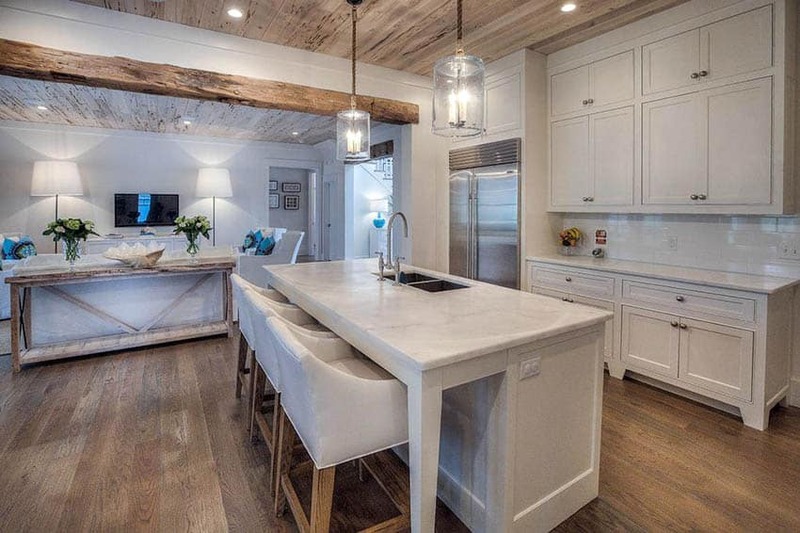 This lovely country style kitchen takes full advantage of the open layout, connecting the kitchen, dining as well as the living area. Warm colors & finishes gives it a romantically antique feel. 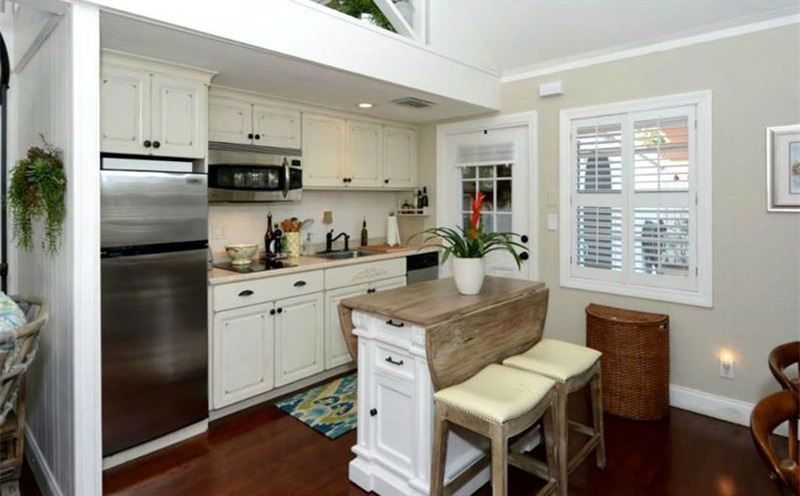 The cream kitchen cabinets match the room’s furniture and decor to provide an inviting ambiance. 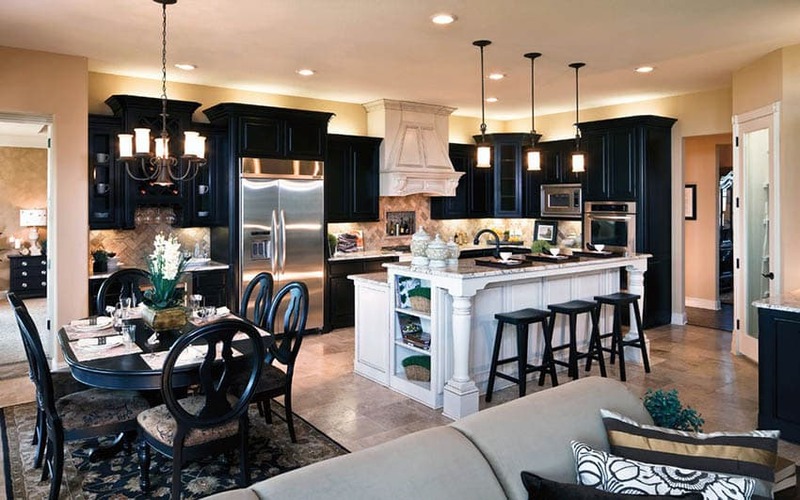 There are many fun ways you can decorate and style your open kitchen and living room. Just keep in mind to avoid blocking views in order to maintain good visibility in both spaces. Play with textures – use textured finishes on some walls such as the backsplash or the fireplace. A subtle change in texture goes a long way and helps keep your design from feeling bland. Contrast the primary color found on your room’s walls and floors (primary color) with color accents (secondary color) to provide a pleasing scale in your design. Add pendant lamps – unique pendant lamps instantly add more style and personality to your design. This especially looks good when placed above an island counter. Add plants – instantly add life to any space by adding live plants and flowers. Not only would it make your space look more alive, but it also helps clean the air! Make sure you have adequate lighting and create focal points on accents such as built-ins, artwork or areas of contrasting color to create visual interest. 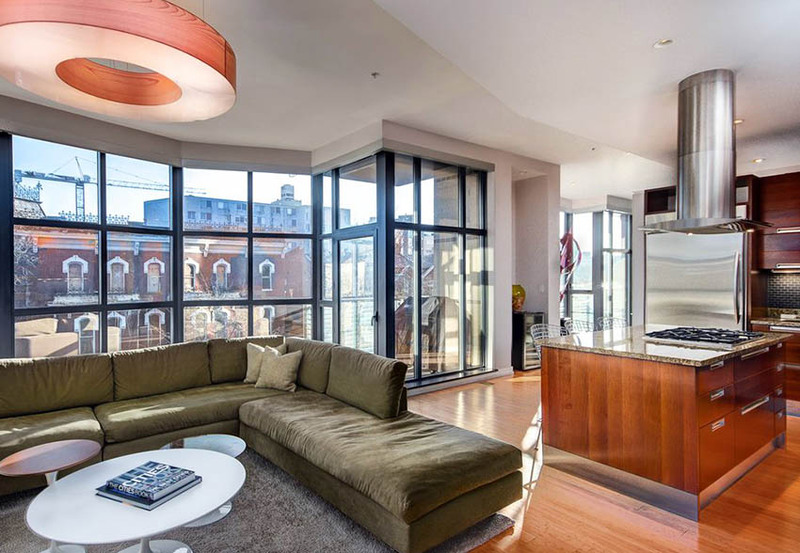 Below are excellent examples of open living room and kitchens you can take inspiration from. Classic French style cabinets in a powder blue and white creates a light and refreshing atmosphere. Brick-clad fireplace and wooden beams add texture and depth to the design. Limited space made using white food the kitchen cabinets the most practical choice. The kitchen is placed perpendicular to the living area, using the console tale and the sofa top separate the two spaces workout completely blocking it from one another. 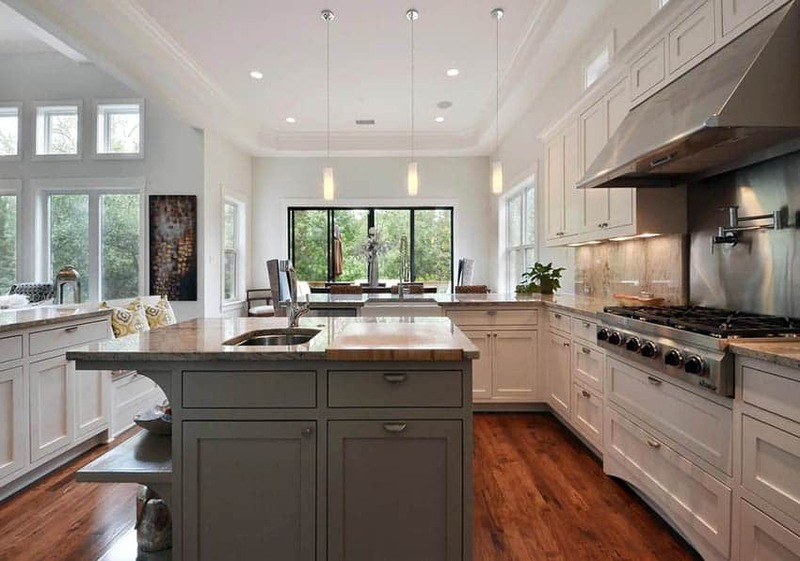 The kitchen is the main feature of this open layout as it occupies most of the space. The sofa faces the kitchen island counters to facilitate entertaining. 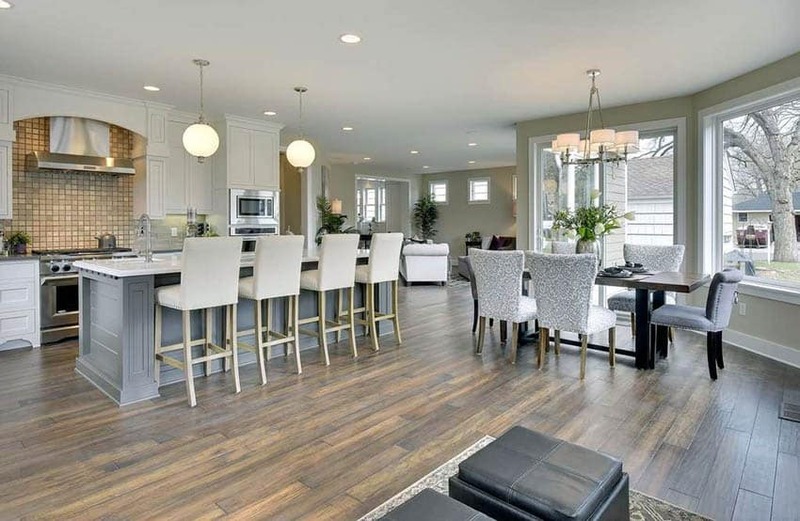 Open plan dining room and kitchen is more common as making them directly connected/share the space is more practical. The efficiency of serving the food just right after you have prepared it makes it an ideal choice for families and those who like to interact with guests. It is definitely the ideal layout for multi-taskers. 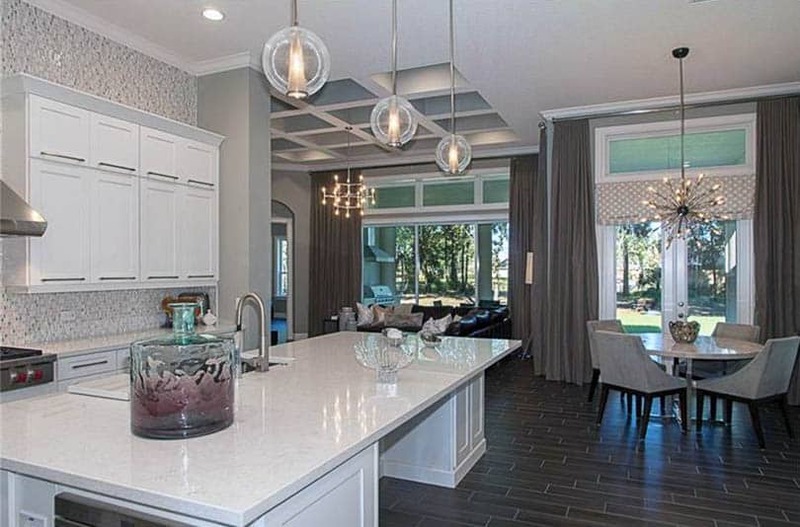 This kitchen is a great place to entertain guests with a wide open concept with plenty of space. Adding that bright orange modern bench adds a nice pop of color and a more refreshing vibe to this sleek kitchen design. A long kitchen peninsula facing the living room with a stainless steel cooktop provides plenty of work space for meal preparation. 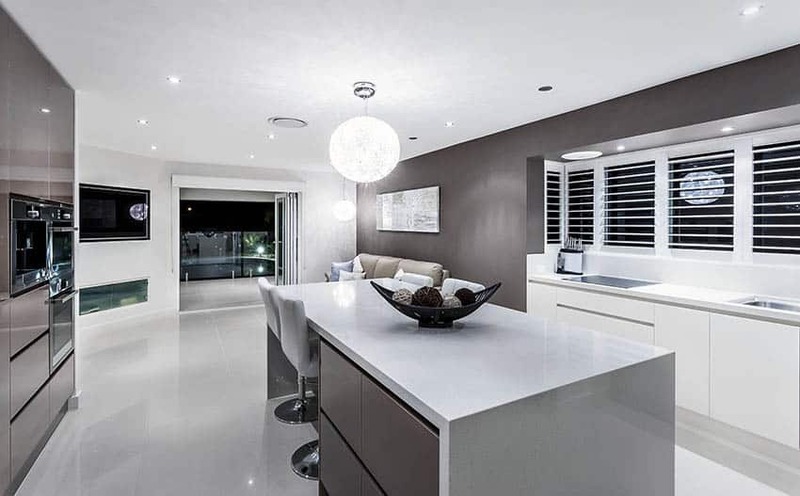 This contemporary kitchen features a large open plan design that reaches in to the dining area and living room. 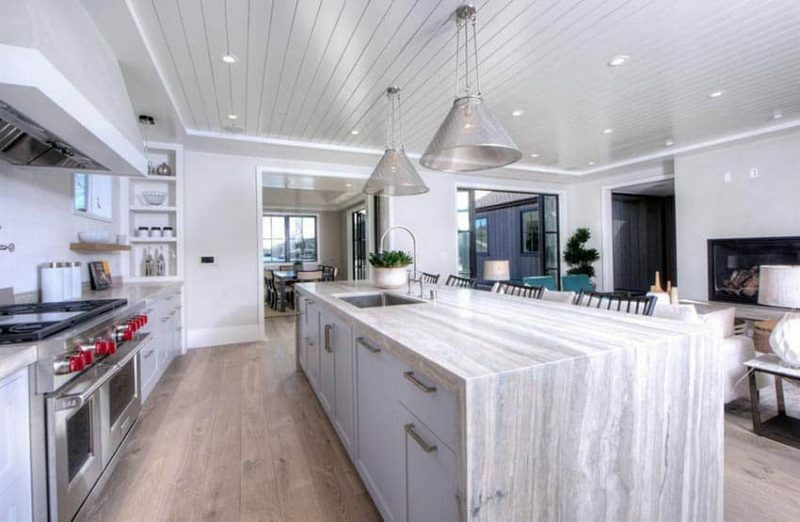 The room has beautiful light oak flooring that ties it all together and looks great paired with the kitchen’s white cabinetry and marble countertops. 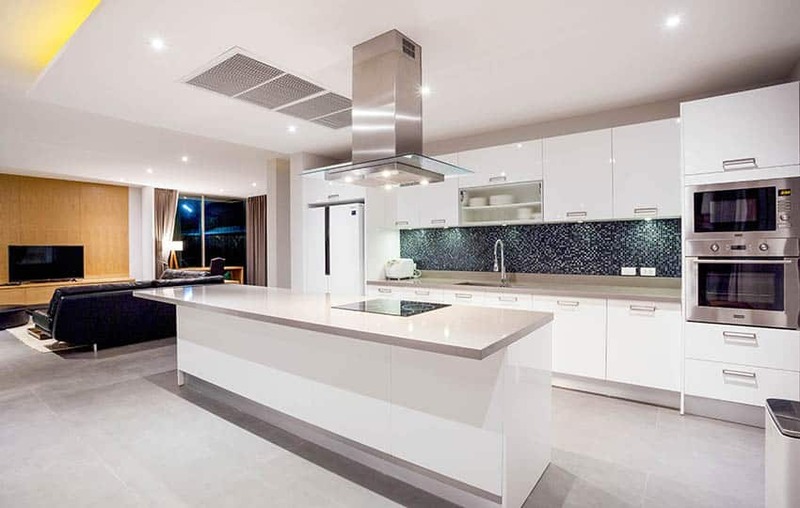 This open plan kitchen is directly accessible to both the dining area and the living area, making it an ideal space for families who enjoy food preparation together. This also helps make the space feel bigger, as less partitions creates the illusion of a bigger space. 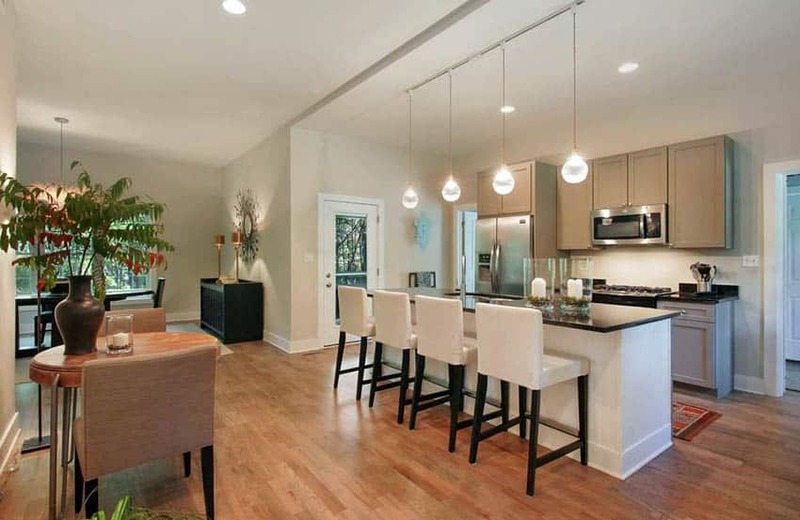 High ceiling gives this kitchen and dining area a spacious feel despite its small floor area. The kitchen is a sleek combination of dark wengue cabinets and marble countertop, while the dining area is a simple 6-seater round glass table, making it an ideal breakfast area. With a very limited floor area available, adapting an open layout for the kitchen, dining and living areas is the most ideal arrangement. Instead of a separate dining area, the kitchen island also doubles as the dining table, enabling the design to maintain a sleek and minimalist feel, with large open areas. The use of glossy white kitchen cabinets helps make the space look bright and very modern, to match the over-all concept of the space. The living area is directly accessible from the kitchen, and the TV is even visible from the cooking area, allowing you to multi-task. 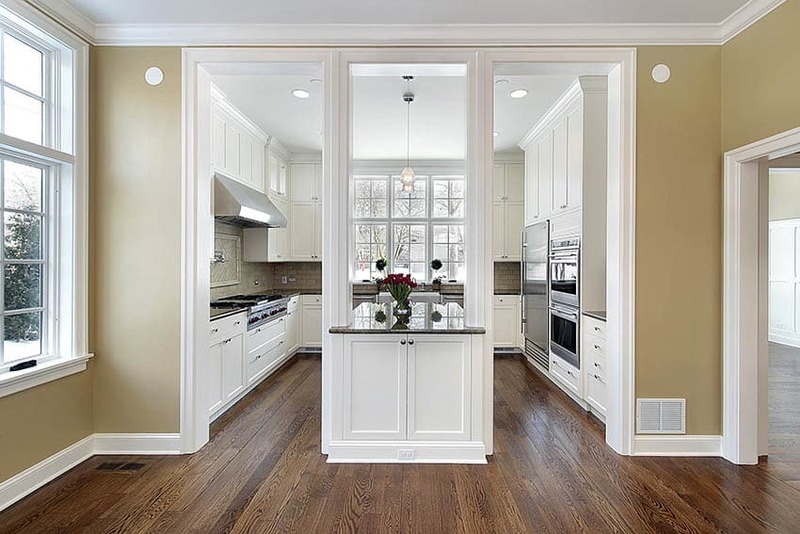 An illusion of division is created using a series of door frames in this classic style kitchen design. The illusion allows you to have a sense of privacy in the kitchen, while at the same time, maintain the open layout as everything in the kitchen is still easily visible. This type of design is often the result of necessity as the support beams may be costly to remove during an open concept remodel. If you want to maintain a definite separation between spaces, yet don’t want to use a full division, using a higher counter to divide the kitchen between the living area is a good design solution. This allows you to create a demarcation between the two spaces, while maintaining enough visibility and easy access between the two spaces. 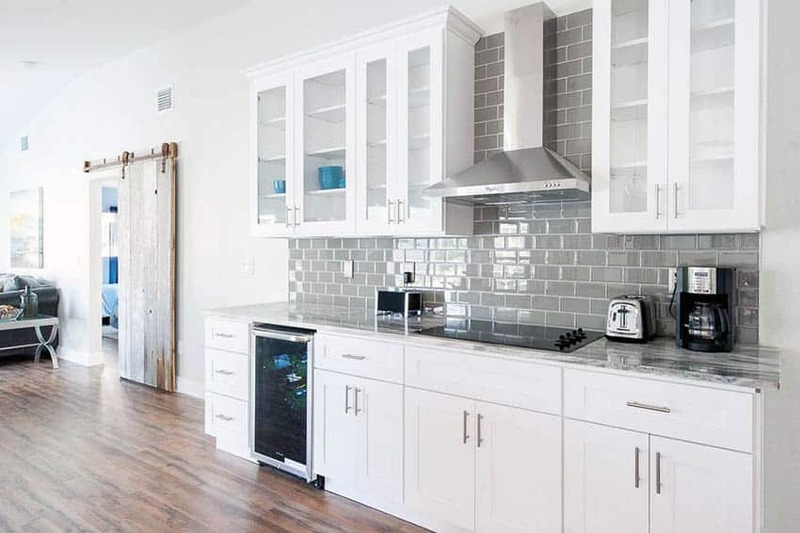 Using all white for the kitchen helps balance-out the dark brown color used on the flooring, while also bringing your attention towards the kitchen area. Marble continues to be a popular material choice for its classic appeal and versatility. It instantly adds a more sophisticated & luxurious feel to any space. 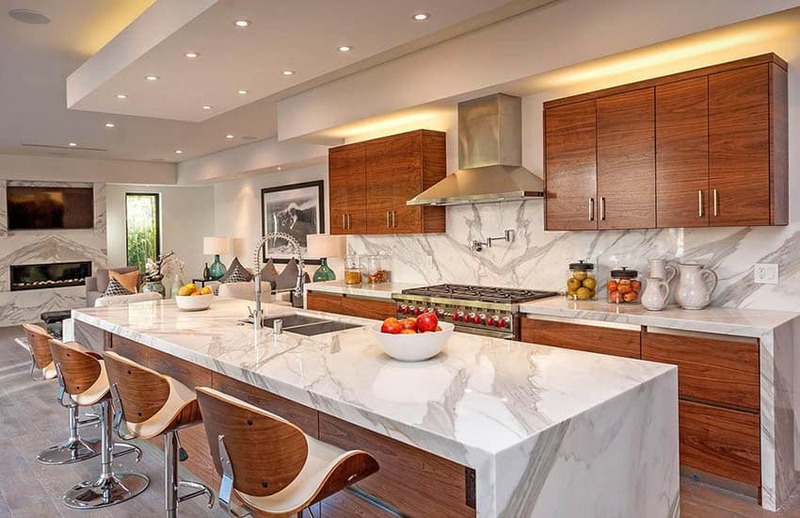 In this case, marble was used on both the kitchen and the living area, tying up the look of the two spaces. 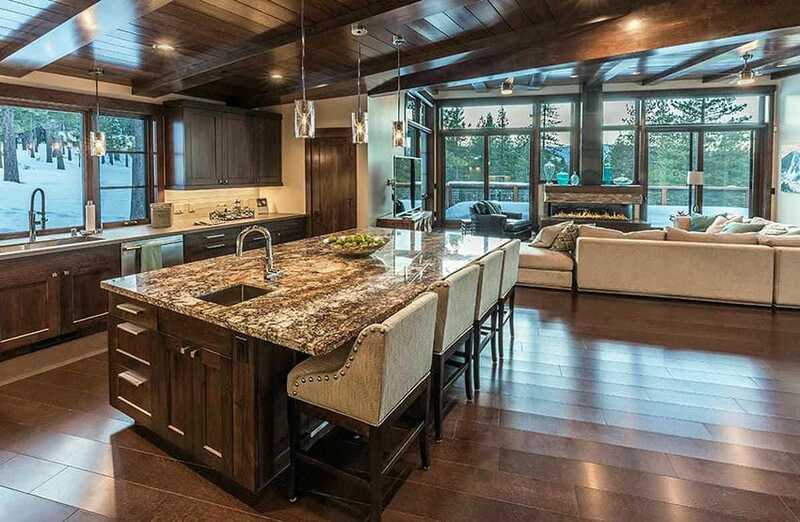 The golden maple cabinets adds a warm touch to the overall feel of the space. Structural limitations sometimes hinder on creating a completely open layout, but you can always find ways to work around it. This dining and kitchen for example, uses a large opening between the kitchen and dining to help achieve the look and feel of an open layout. 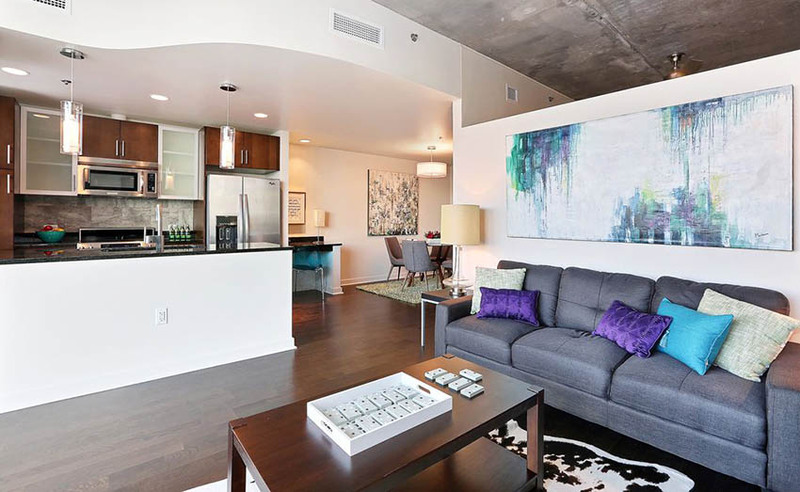 The small floor area makes an open plan necessary for spaces such as this example. With careful planning, it was successfully able to create an open layout that combines the kitchen, dining and living areas. 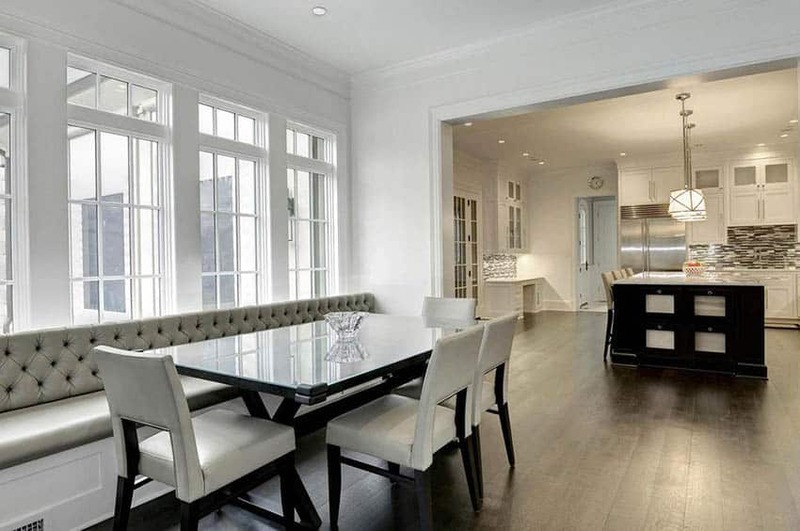 It also maintains a cohesive look, featuring classic style furniture and cabinetry. 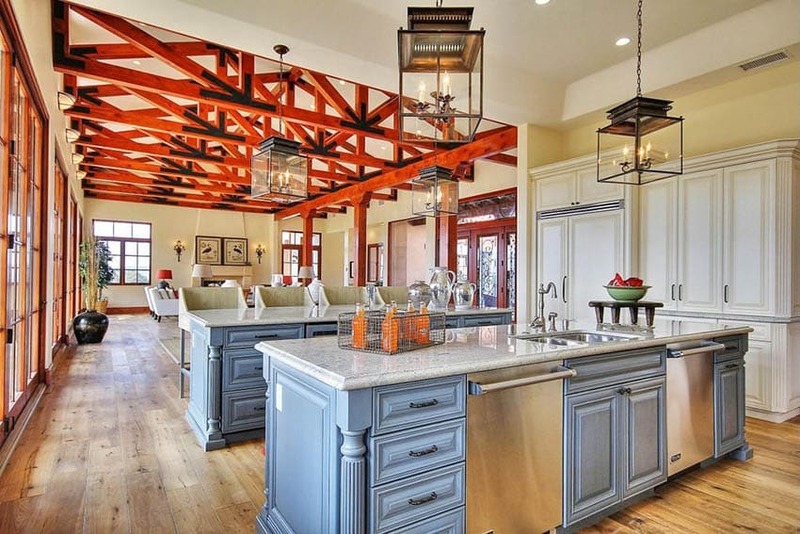 Elegance with a touch of rustic appeal is the main charm of this open layout kitchen. Classic French style architecture and matching furniture pieces, combined with classic-inspired kitchen cabinets and lighting makes this design look refreshingly classy. Modern with baroque inspirations, this contemporary kitchen and living area is a gorgeous example of open plan kitchen & living rooms. The amount of natural light and the tasteful finishes used on the floors, walls and ceiling not only add to the beauty of the space, but also help tie up the design/overall look. 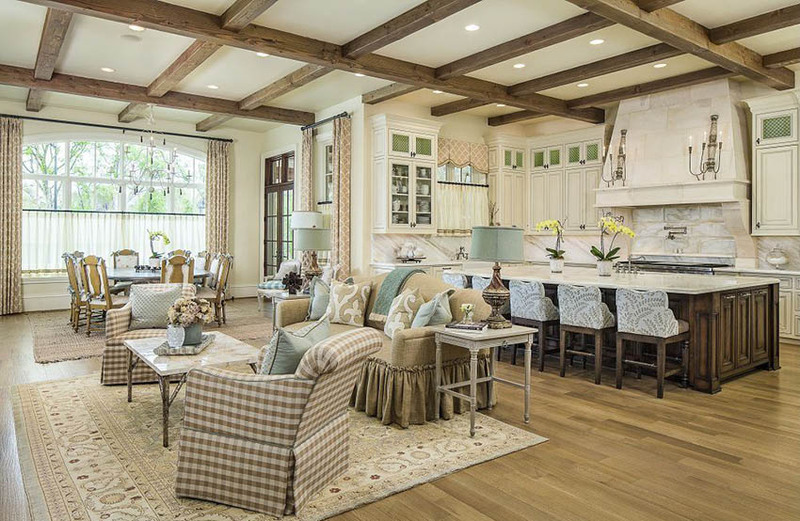 By exposing the solid beams and trusses on the ceiling, the space not only adds a more open feel to the space, but also gives it more personality. Soft cornflower blue kitchen cabinets gives a light and refreshing feel to the mainly warm-toned color scheme. Another great example of an open layout with a clear space demarcation. This kitchen uses kitchen counters to separate the kitchen between the other areas, while still maintaining an open layout. Many apartment and condo owners are faced with how to design a smaller space that provides for the kitchen, dining and living room. This contemporary kitchen offers an open concept with breakfast bar island adjacent to the living room with a sectional couch. Small spaces benefit the most in open layout concepts. There are, of course limitations and challenges depending on the floor plan your are working on, but once you find a way to work around the limited space, the open space layout’s benefits would definitely outweigh its cons. Smaller spaces would need a more careful planning and should keep in mind how you use the space in actual practice. The design should definitely make your life easier according to your routine/habits, or otherwise help improve your current practices. For kitchens, modular kitchen cabinets is a great practical choice, as it allows flexibility and mobility. Because of the possibility of a limited counter space, do consider built-in appliances to help save space. This apartment features a compact kitchen with peninsula and an open plan layout opening to the dining area and living room. Wood flooring tie the rooms together while decor such as the dining room’s area rug and the living room’s artwork help to designate each individual space. 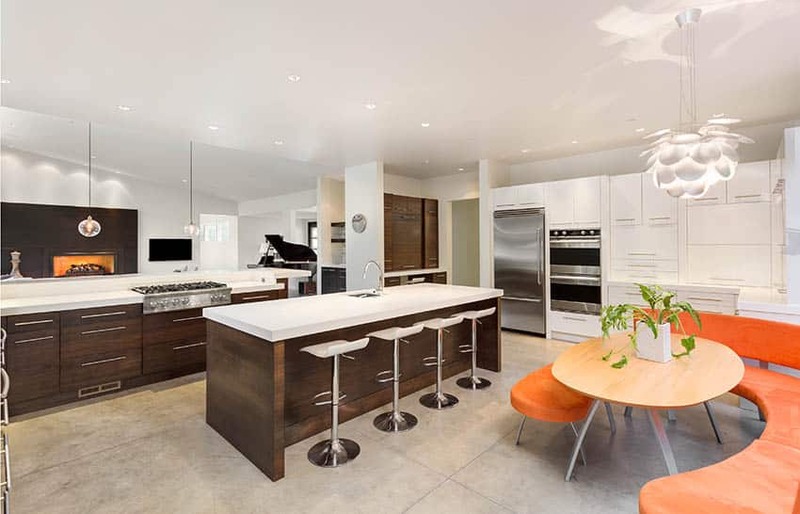 This contemporary kitchen’s design allows the cook to face family and friends while preparing meals and looks out upon the main living space. A marble topped peninsula is ideal for families to eat on the go as well as for socializing and entertaining. 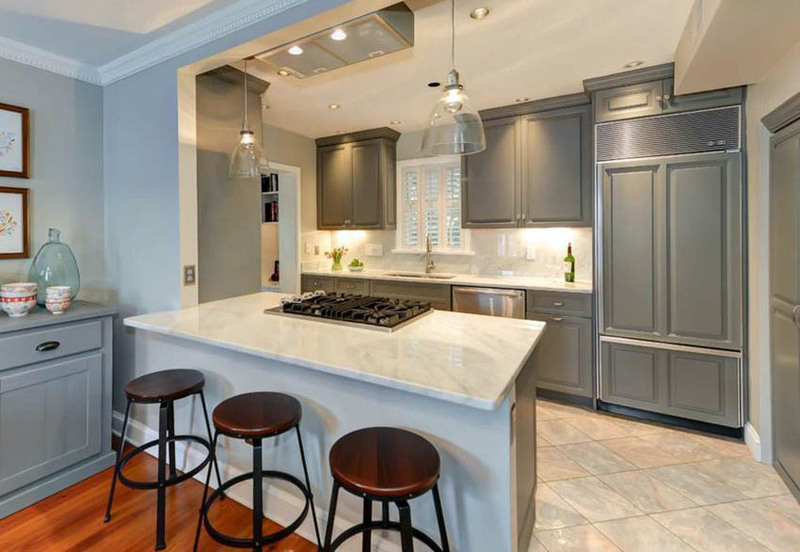 The gray and white kitchen design offers a neutral complimentary color palette that is attractive and sought after. 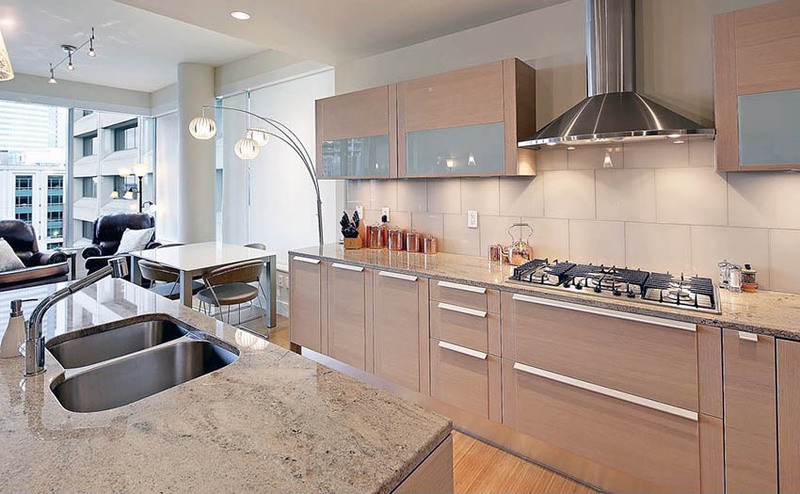 This apartment features a contemporary kitchen with modular cabinets that opens up to a small dining and living area. A large glass window allows plenty of natural light that is enhances by a variety of light fixtures such as the modern track lights, globe pendant floor lamp, recessed and under cabinet lighting. 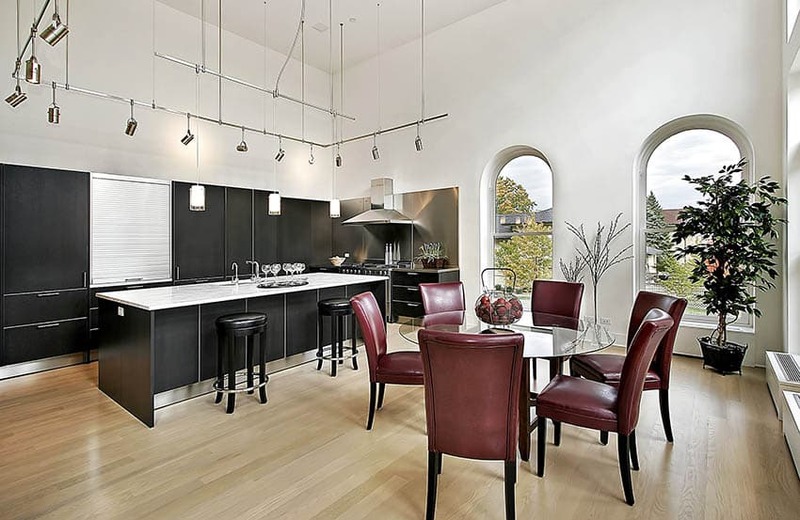 This open plan kitchen opens to a small dining area and living room. The microwave oven is built-in with the overhead cabinets because of the very small countertop space left. For small kitchens finding sufficient counter space can be a issue. Using a portable island is a great way to allow diners to eat-in the space and help the cook face outwards while keeping an eye of small children or entertaining guests. This wood topped portable kitchen island also has a countertop that hinges up providing even more space when needed. Some layouts really don’t have the luxury of the space, so a more compact design is needed such as this. You can do away with a kitchen island if there is really no space for it, and try using sleek & compact appliances that fits your kitchen counters. 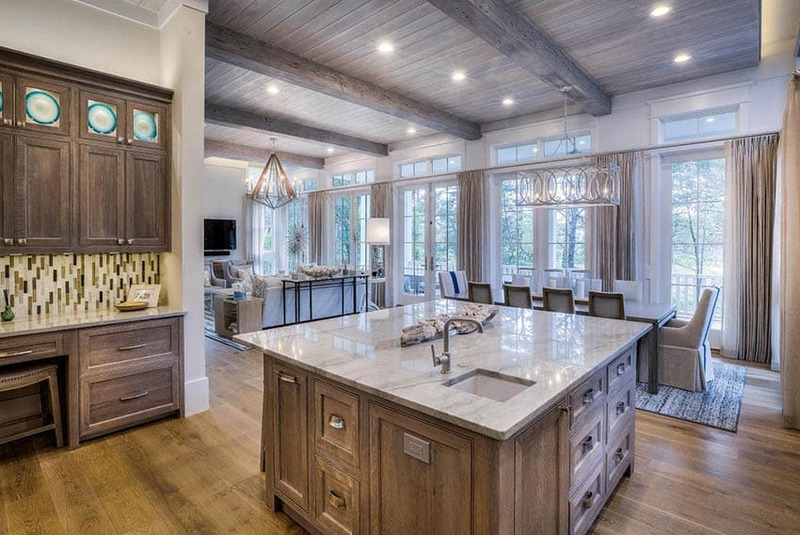 For even more open plan ideas visit our gallery of open concept kitchens.